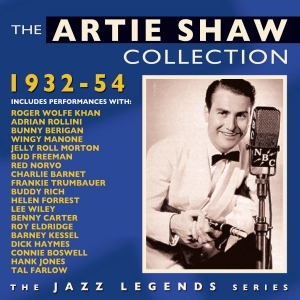 Artie Shaw was a unique personality in jazz, big band and swing music – as clarinettist, bandleader, composer, and arranger, he pursued his own often idiosyncratic, original and some might say perverse approach to his music and career, and along the way produced some of the most popular and memorable recordings of the swing era. He came to prominence when in 1936 he introduced strings into the performance of what was effectively a chamber piece “Interlude in B flat”, and he kept strings as feature of his swing orchestra for a number of years. He reached the zenith of his popularity in the ‘40s with hits like “Begin The Beguine”, undoubtedly his best-known recording, “Frenesi”, a tune which he introduced to the jazz canon, and his composition “Summit Ridge Drive”, his success fuelled by his matinee idol good looks and his colourful private life. This great value 43-track 2-CD collection continues our popular and successful Jazz Legends series on the Fabulous label. It traces his career across the two decades and more from his earliest recordings in the early ‘30s through to his effective retirement from the music business in 1954. It includes some lesser known material from the ‘30s with other leaders’ bands – Roger Wolfe Kahn, Adrian Rollini, Wingy Manone, Red Norvo and Frankie Trumbauer before he formed his own orchestra, and it draw from recordings both by his full orchestra and the various incarnations of his breakdown ensemble The Gramercy Five. It’s an enjoyable overview of the career of a master craftsman and unique jazz personality.